The Liceu closes its season with the slightly surprising restaging of its own setting (co-production with the Teatro Real de Madrid) of La Favorite’s original French version by Donizetti. This opera had been very popular at the Liceu during the 19th and 20th centuries, with over 200 accumulated performances, although only 10 of which were of the French version and these took place in the early 21st century. The restaging appears surprising as 16 years ago it was already not very well received and things don’t seem to have changed this time around. In 2002 this Favorite was stage directed by Ariel García Valdés and it has now been ‘updated’ by Derek Gimpel. The results have not improved, however. This honour and unfaithfulness drama set in a totally unlikely Medieval Spain, with a final redemption of the sinful woman through her death (as usual), is nowadays very hard to sell to an audience in a satisfactory way and this restaged production doesn’t achieve it. The scenography by Jean-Pierre Vergier, nice and well-crafted but random and alien to the drama, doesn’t solve the problem of the huge emotional distance with which today’s audience experiences La Favorite. Likewise, the flamboyant and extravagant costumes – also by Vergier – introduce an element of colour that doesn’t solve anything either. La Favorite is pure bel canto, and of the best kind. Bel canto has to be well sung, and if the singing works, the dramatic insufficiencies come second, to a certain extent. Therefore, since this Favorite was well sung one should consider that the performance was a success. In the first place, stands out the work of mezzosoprano Clémentine Margaine, debuting at Liceu. With a wide register, a powerful voice, good projection and diction and a warm and fleshy timbre, Margaine delivered a very high level Leonor de Guzmán and was the winner of the night. Less clear and precise was the diction of North American tenor Michael Spyres, although the courage with which he attacked the numerous stratospheric top notes from Fernand’s role earned him a great success, despite the much-anticipated high note in his crucial aria “Ange si pur” not being quite clean. Baritone Markus Werba, also debuting at Liceu, delivered a thoroughly correct but not memorable Alphonse XI. The role required greater strength and vocal presence. Ante Jerkunica, instead, from a very well-placed bass voice, with thickness and yet not too much weight, shone in the somewhat secondary role of monk Balthazar. His threats to the king at the end of the second act were actually frightening. Remarkably well was soprano Miren Urbieta-Vega in the minor role of Inés and very good was also tenor Roger Padullés as Gaspar. The choir was uneven, not too well the women section in the island of Leon and better the men in the mixed choral scenes. Patrick Summers, with a vast bel canto curriculum, was conducting and achieved something fundamental, which is to fit together with the voices, but didn’t obtain a great sound refinement from the instrumental ensemble. Debatable, and possibly erroneous, was the decision of fragmenting the original ballet music and interspersing it in between acts with the curtain down by way of a made up intermezzo. If included, this ballet music needs to be danced, and if not danced then it is better omitted, since musically it certainly amounts to little and when fragmented it only becomes a hindrance. La Favorite by Gaetano Donizetti. Clémentine Margaine, mezzosoprano. Michael Spyres, tenor. Markus Werba, baritone. Ante Jerkunica, bass. Miren Urbieta-Vega, soprano. Roger Padullés, tenor. Orchestra of Gran Teatre del Liceu. 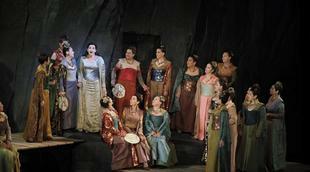 Choir of Gran Teatre del Liceu. Patrick Summers, conductor. Derek Gimpel, stage director. Jean-Pierre Vergier, scenography and costumes. Dominique Borrini, lighting. Co-production by Gran Teatre del Liceu and Teatro Real de Madrid.